For a while now I've been wanting to start a little shop to sell patterns and other items I've designed, but up until today I haven't been able to find the time. 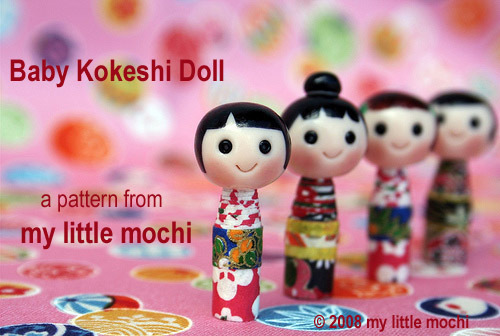 So I'm so excited to post that I've finally set up shop and my first item is a pattern and tutorial for these little baby kokeshi dolls. I designed these as gifts for Girl's Day this year and they are just under 1 1/2" (38 mm) in height and so much fun to make. The pattern and tutorial is available as a 9 page PDF file that features color photographs with a material list, step by step instructions, and lots of tips. It was a challenge trying to keep the PDF file size down since I included so many photographs, but I wanted to make sure that there was enough steps that even a beginning crafter would find it a breeze to make. And it really is, I promise! I'm not good at self promotion but I really hope you'll be as excited about your baby kokeshi as I am. Make some for yourself or as gifts for friends. 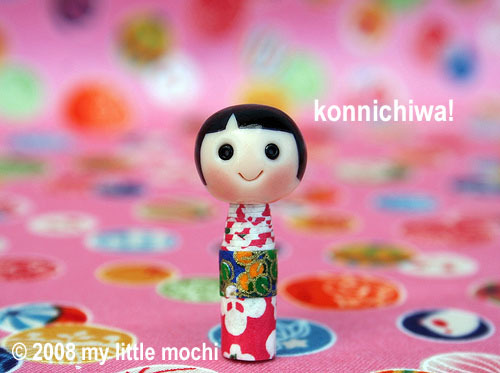 They're the right scale for decorating your Re-ment or other doll house miniatures and the perfect size kokeshi doll for all you Blythe fans as well. Here's one sitting in Miss Kitty's living room. I also include some ideas for other uses for your finished kokeshi and an option for turning it into a bead. So if you want to learn how to make a baby kokeshi, go to my shop site. Mahalo nui loa everyone! Oh my goodness,not you too! It's all about the $$$$. Congratulations on the new shop! How exciting. what a great adventure! way to go! Yay! I've been hoping you'd have a shop someday! I just ordered my baby kokeshi pattern, I can't wait to try it! Oh, these are adorable! But I was hoping you were selling the finished ones! Knowing me, I would just look at the pattern over and over and say, "someday... sigh...!" LOL! Myra, way to go! And such an appropriate item on the first go, given your blog title and header. I can only imagine how much hard work you put into setting up shop, but also putting together the pdf file?! I love your gumption! BTW, the other night we saw a small hedgehog and I immediately thought of you and your hedgehog creations. Too cute! 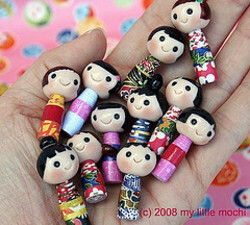 You made a amazing work, those Kokeshi are adorable! TO HELL WITH THE PATTERN...SELL THE DOLLS!!!!!!...Congratulations! Those are just the sweetest things..
keeping my fingers crossed for you. although I know you will sell tons of these! I'm a lurker but I had to say I think this is a great thing for you to share your ideas and poo on grumpy comments. Best Wishes on your new shop! yay -- you finally opened your "shop"! i'm happy for you ... good luck with this new endeavor. but remember, keep it fun and don't add any stress to your life by trying to add too many items to the shop. as much as we like to see (and now buy) your crafts, it should bring you pleasure. :) omedetou! It is about time you had a shop!!! Finally, a shop! I, for one, am glad that you will finally get something for all your hard work and creativity. These are super cute! Your work is amazing! 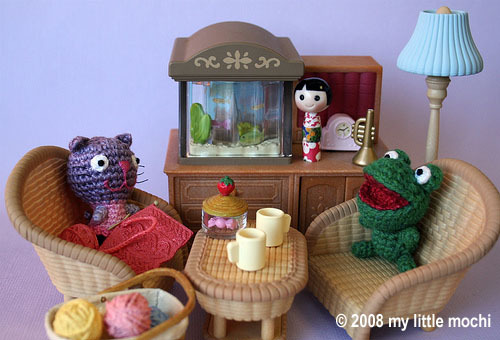 yay for you and these dolls, they are totally pretty! Oh so sweet and just perfect for Girls Day! Here in the US we celebrate Father's Day and Mother's Day but not Boys & Girls Day like they do in Japan. Best of luck & best wishes! they are so wee and cute! why shoulnd we sell our hard-earned-sweat-and-tears ladden products!! Congratulations, Myra! I know your shop will be a big success and this is an adorable project! So wonderful! I wish you all the best on your newest endeavor! I'd never heard of Girls' Day before reading your site...guess my head's been in the sand! Way cool!!! Hello, today I decided to post a comment, your blog is one of my favourites... and i pass by almost every day. i appreciate very much your work. Thank you for all the different things. Myra I'm so excited that you are doing this.Can't wait for your next pattern.